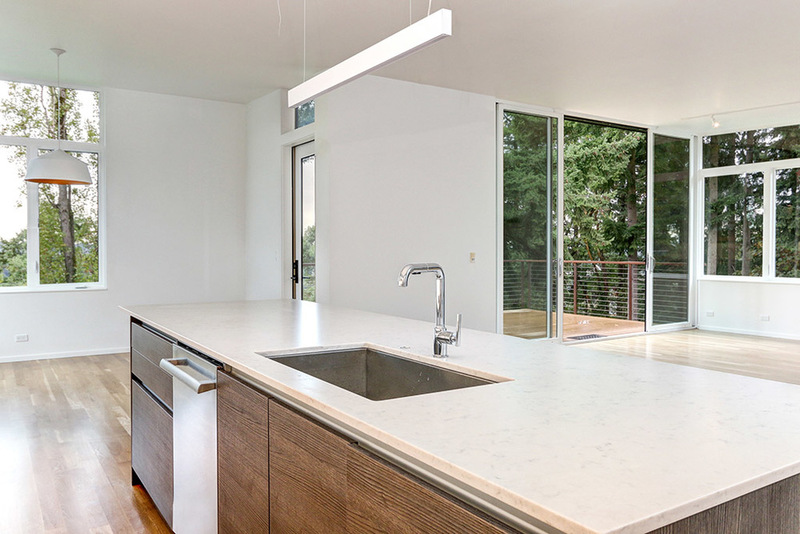 LEICHT Seattle is pleased to offer premium kitchens and whole-house casework. A leader in modern design, LEICHT is the largest custom cabinet maker in Germany, with worldwide distribution and over 85 years of production experience. It stands for lasting value, durability, and aesthetics. LEICHT is equally committed to design, craft, quality and ecological excellence. Recognized for innovation and technical sophistication, LEICHT’s advanced logistics and manufacturing ensure accurate fulfillment and timely delivery. Producing over 1,200 cabinets daily, LEICHT is prepared for projects of any scale. High quality in product and service is its number one policy. Sustainability: water-based lacquers, timber from sustainable forest management (PEFC-Certificate), GS Safety seal 'Healthy Living' certificate by the German Community Furniture Quality Association, and CARB-2 (strictest air quality measure) are part of the high-quality standard for LEICHT cabinets. A near Passive Haus at the top of Issaquah. Modern Scandinavian inspired design. Super insulated house, solar panels. 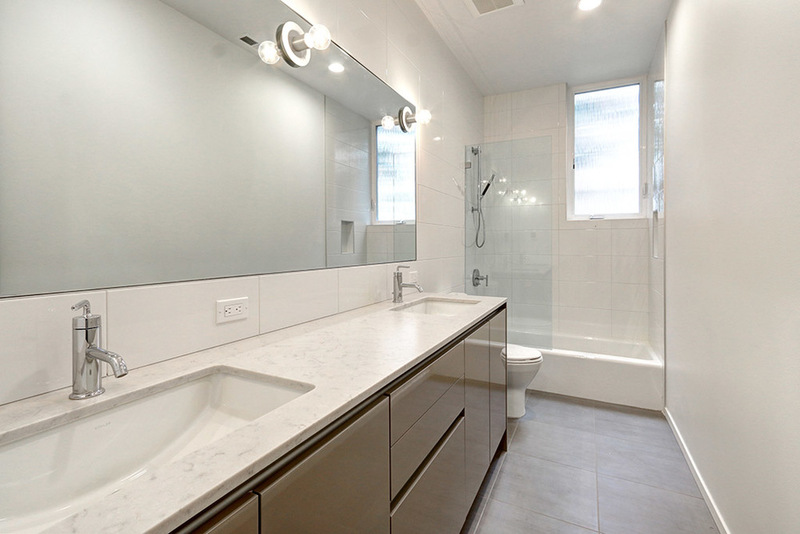 Featuring LEICHT cabinets in LUNA acrylic glossy frosty white (AG 120), with handle-less channel in matching white. White glass Miele ovens, Island with induction cook-top and down draft hood. LED under uppers, Miele integrated fridges and dishwasher full-overlay with LEICHT panels. Design by YS Studio. Photos by Lara Swimmer. East meets West in the Northwest refined mid-Century modern remodel. Cabinets by LEICHT in frosty white laminate (K 120) and aluminum handle-less channel, marble full slab back-splash, custom stainless counters integrated sinks and shelve, white oak floors, architectural steel and glass stair case, fire place surround, designers LED lighting and pendents, ceiling fan, smart home controls, and other high attention finish details, brings new life, usability and modernism to a classic mid-century residence in bridle Trails. A modern spacious custom family residence on top of Issaquah highlands, with western views, target Built Green 4-Star certification. Featuring LEICHT cabinets in Oak Smoke Silver (KH 244) laminate kitchen, dinning and office cabinets with aluminum channel handle-less system. LED under upper wall mounted finished in frosty white satin lacquer upper (FS 120). In collaboration with Stephenson Design Collaborative. Photos by Andrew Pogue Photography. A high-quality home for a creative young family. 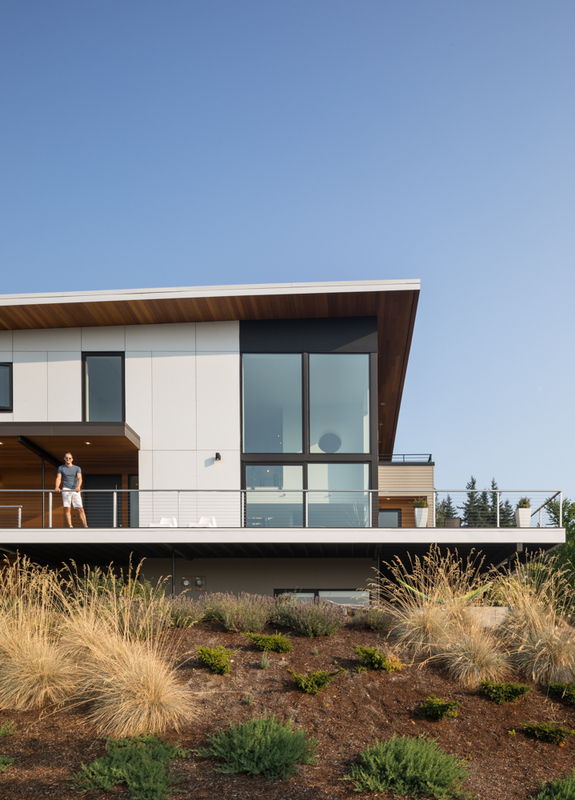 The house design is minimalist and graphic, black white and walnut are the dominant colors, and variety of textures is used along with steel and glass. The open plan kitchen is at the top of the stairs on the first floor and opens up to the outside with floor-to-ceiling windows. LEICHT Cabinets in Frosty White acrylic and Walnut wood decor (KH 368h) laminate with handle-less channel system both horizontally and vertically. The kitchen as the center of the home – that was something the whole family wanted. 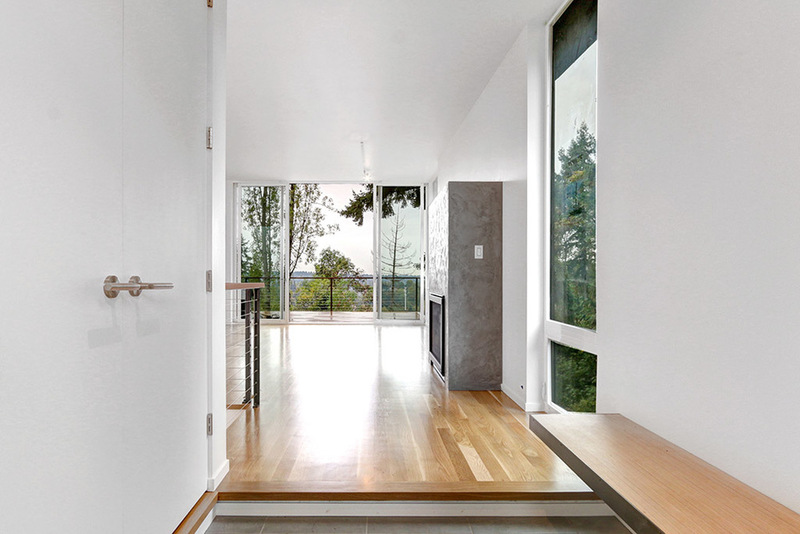 So there is no living space in the traditional sense in the Madrona house, simply causally positioned seating in a range of niches. Architecture by Stephenson Design Collaborative, detailing by YS BUILT, Photos by Lara Swimmer. A Kitchen remodel at a condo the Talisman, in Capitol Hill neighborhood in Seattle. A mid-century gem by architect John Graham (architect for the Space Needle). Featuring LEICHT cabinets by YS, in Laminate Frosty White K120 and aluminum channel handles, with custom walnut shelves. Photos by Lara Swimmer. A mid-century inspired single custom family home in Bellevue, dark outside and bright inside. Living space on the upper floor with western views, allows high ceiling and much light thru tall windows and skylight to brighten up kitchen and living room. in the kitchen LEICHT cabinets in smoke oak silver (KH 244) and white laminate, in a channel handle-less systems, provide graphic contract to the white oak floors. Complementing a Silstone suede finished carrera counter-top, and custom hood box in brushed stainless steel. In the powder room wall hung vanity in oak smoke silver provides natural warm color on the brushed basalt wall tiles, and provide texture below a skylight. Kids bath vanity in in sand gray gloss (KG 136) is vivid and durable on the clean background of quality white tiles. SAO PAULO, BRAZIL - The two-story concrete house, is home to a music studio. A secluded patio with lounge furniture situated between the kitchen and service areas while the owners enjoy representative living in a spacious area with an adjoining library. Reading, listening to music, enjoying guests‘ company in a totally relaxed atmosphere – these top priorities of the owners demanded an open, inviting and casually furnished room with the character of a lounge. The kitchen is virtually “encapsulated“ at the center of the ground floor, it is closely connected to the outside thanks to the floor-to-ceiling windows looking onto the patio. ARCHITECTS: MARCIO KOGAN | DIANA RADOMYSLER:"FOR ME THE KITCHEN IS...ALONG WITH THE BED THE MOST IMPORTANT PLACE IN A HOUSE"
With the extensive worktop, high-grade appliances and easy-to-access storage space, this is a room that begs to be cooked in. GÖFIS, AUSTRIA - the striking recess in the rear façade overlooking the garden provides plenty of space for a spacious veranda. This is protected by the roof that projects from the side. The living room, cooking and dining areas merge with one another and are arranged around the terrace. The house is flooded with light and the floor-to-ceiling windows open out over a vista of the meadow with an orchard and clumps of trees. The kitchen and living room areas are at an angle to the veranda, giving rise to an intense connection between exterior and interior. The kitchen, which consists of two food preparation islands opposite each other, is defined on one side by an all-white wall unit, which also houses the appliances. The color of the islands – a brilliant petrol color – creates a delightful contrast with the warm, somewhat subdued shades of the interior. The overall symmetry conveys a feeling of peace and clarity. ARCHITECT: ERWIN WERLE "FOR ME THE KITCHEN IS......THE MAIN ROOM FOR COMMUNICATION IN EVERY HOME" Space and transparency with plenty of private room - that is the lasting impression of the bungalow in Göfis/Vorarlberg. EPPINGEN, GERMANY - a Caribbean atmosphere with an outdoor pool and palm trees in the garden. The two-storey Villa Belice is situated in a quiet neighbourhood bordering a nature reserve. The building is characterised by recesses and projections in the façade and dramatic contrasts in colours and materials. ARCHITECT: PATRIK YVES LEE "KITCHEN IS FOR ME...THE HEART OF THE HOME"
An unobtrusive door next to the matching unit front leads into the pantry. The appearance is dominated by the dramatic contrast between white and black – the theme from the façade of the house continues skilfully on the interior. While the side of the house that faces the road is mainly closed to protect privacy, the front opens out on both levels in places and looks out over the landscape. The kitchen is at the heart of the house, immediately adjacent to the covered veranda. The transition into the living room area is fluid and accentuated by a step. The kitchen is kept very minimalist with a food preparation island opposite the wall unit with handle-less, high-gloss fronts. STUTTGART, GERMANY - A spacious house built on a small plot in Stuttgart‘s Feuerbach district. 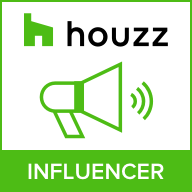 The house is a homogeneous concrete sculpture, surrounded by lush green; from the floor-to-ceiling windows, you have a fantastic view of the vineyards opposite. As a contrast to the cool look of the concrete, the owners wanted natural materials and warm colors inside. ARCHITECT: CARMEN SCHNEIDER: "FOR ME THE KITCHEN IS...A CENTRAL PLACE FOR THE ENTIRE FAMILY"
The kitchen is spacious and opens onto the living area. The virtually floor-to-ceiling unit run is custom-fit into a niche and has a very homely look with its genuine oak front. It is an exciting contrast to the blue on the walls and the high-gloss white of the kitchen island. The kitchen is not only the heart of the home but looks onto the outside thanks to the floor-to-ceiling windows and extends directly onto a courtyard. Top-quality fencing provides discreet protection from passers-by and guarantees the occupants‘ privacy. TAINAN, TAIWAN - The Community Clubhouse, located in a residential building in Tainan, offers its residents spacious rooms for relaxation and joint activities on three floors; spa areas are just as important as yoga rooms and a shared kitchen. Dark colors, exquisite woods and indirect lighting dominate the elegant interior. The kitchen is completely coordinated with the lounge and merges with it to become one, helped by the handle-less fronts and the unit installed flush in a niche with an elegantly integrated work-area. A worktop juts out of the spacious food preparation island, lightening the effect of the island block, and can be used by several people as a bar. Embedded in a complex ecosystem, the Clubhouse is operated energy-efficiently and is surrounded by a water landscape and lush trees. The architect‘s main concern was to create a building in which nature and inhabited space merge. ARCHITECT: KENG FU LO "FOR ME THE KITCHEN IS... THE BEST PLACE TO COMMUNICATE WITH PEOPLE"
Many of the above projects were developed by another company, involving individuals who are now engaged with ABC Build, LLC, dba YS Development, are included solely as a reference for prior work by those individuals.